The 18-car Union Pacific train blew its horn about 50 feet from the U.S.-Mexico divide. There, in a dusty one-acre lot, an American road ends -- literally. And it was where 12-year-old Yoryet Lara hoped to get a glimpse of her mother. "It's been so long, I need to see her," Yoryet said. "Other children get to see their moms on special occasions like Mother's Day. I don't. It's not fair," she said as she wiped away tears. Yoryet's mother, Trinidad Acahua, once lived in the U.S. illegally, in El Paso, Texas. She had a job, paid her rent, stayed out of trouble. She had two children here, making them both U.S. citizens. But one day she ran a stop sign on her way to work and was pulled over. When she couldn't produce paperwork for insurance or proof of car ownership, she was taken into custody and eventually deported. That was seven years ago. Just as the 16th annual Border Mass, hosted by the area's three dioceses was set to begin, the girls rushed the international fence, calling out for their mother, who was joining them at the Mass from the Mexican side of the fence. "Don't cry my queens, don't cry," Acahua sobbed. "I love you all very much my daughters." The family's lone embrace was an interlocking of fingers in the chain link fence that divided them. "Mommy, I miss you!" said Jocelyn Lara, 10. "Ay Mommy!" 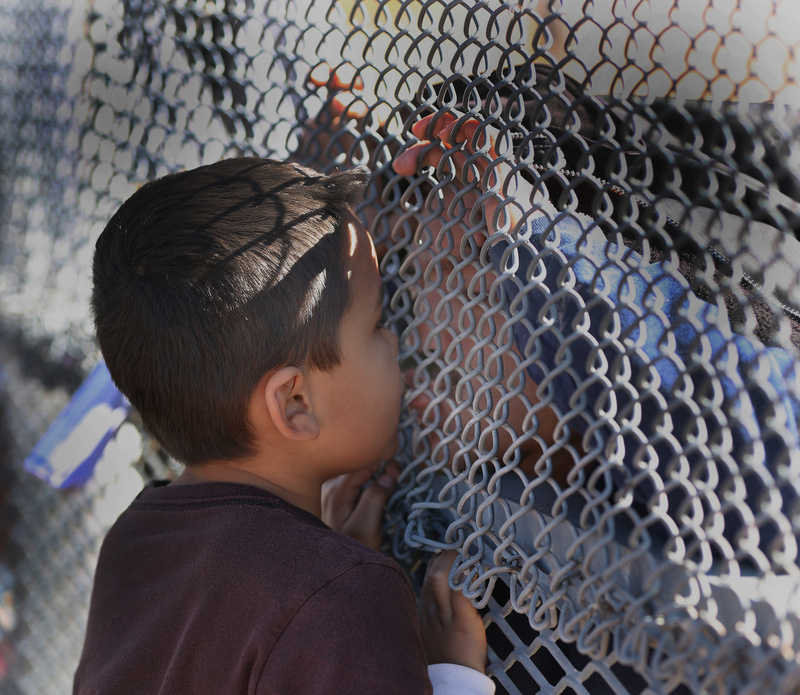 Their mother brought Emmanuel, the girls' 3-year-old brother, to the fence as well. "Hi little one, I'm your aunt," the girls' aunt, Ines Zepahua, said in greeting her nephew. She has never been able to hold him. That was the backdrop for the annual Border Mass celebrated by bishops of the dioceses of El Paso, Texas, Las Cruces, New Mexico, and Juarez, Mexico. "We have a prayerful purpose," said Bishop Mark J. Seitz of El Paso. "This Mass started as a remembrance of the thousands of people who have died in their desperate trek to come to the U.S. We pray for them as well as those immigrants who are here now but who live in fear of exploitation and deportation daily." The Mass was a cross-border experience. A lector read the first reading from Juarez in Mexico, while the second reading was read on the American side. The responsorial psalm was recited together, and Communion was shared on both sides. Because the border is marked there by a chain-link fence, every part of the Mass was visible from both countries. Bishop Seitz said the three communities came together in the liturgy, just as they do daily in responding to the needs of immigrants. "They're not coming here looking to get a new car or a new house," he said. "Often, they come here out of fear of the lives they have back home. The life of the immigrant is not easy." That desperation was evident when, during Mass, 10 to 15 people cut through a seam in the border fence to cross illegally into New Mexico, according to the U.S. Border Patrol. "It looks like we had about eight breach points," said Joe Romero, acting Special Operations supervisor of the El Paso sector of the Border Patrol. Romero said many of those who tried to cross got spooked and turned back. At least three were apprehended on the U.S. side. Tension ran high when a Border Patrol agent approached a young man in the crowd during Mass. Ultimately, the agent walked away from the man, although it wasn't clear whether the man was one of those eventually arrested. Despite the attempts to take advantage of the Mass and sneak into the country, Romero said it won't be an obstacle to future such events. "We understand the purpose of the Mass and will not let this first-time breach prevent us from being supportive of it in the future," he said. "This was unprecedented," said Bishop Seitz. "We've always known about the desperation of those who are attempting to come to the U.S. in search of safety. What happened (at Mass) shows that, in spite of President Obama's recent executive action regarding immigrants who are already here, the need, the desperation to flee to safety, remains." As the liturgy came to a close, the celebrants' words, "Mass has ended. Let us go in peace," rang out. Yoryet and Jocelyn reluctantly said goodbye to their mom. "I love you Mom! I miss you!" they said. The two siblings walked toward their aunt's SUV to leave. And another Union Pacific train blew its whistle in the background.